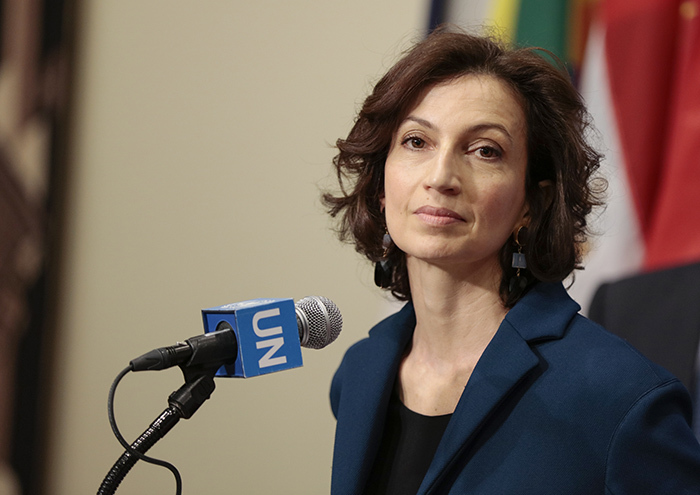 United Nations, New York, USA, 24 March 2017 – Audrey Azoulay, Minister for Culture and Communication of France during a Press encounter today at the UN Headquarters in New York after her Security Council Meeting. The Security Council unanimously adopted resolution 2347 (2017), condemning the unlawful destruction of cultural heritage in the context of armed conflicts, notably by terrorist groups. The resolution also requests Member States to take appropriate steps to prevent and counter the illicit trade and trafficking in cultural property originating from a context of armed conflict, notably from terrorist groups. I want to pay tribute to UNESCO’s key role in protecting heritage and promoting the diversity of cultures as an instrument of peace, as the moral conscience of humanity, reaffirming that culture connects people to their history, their country. Thanks to UNESCO, states have made a commitment by adopting texts that will help safeguard our common heritage. The overall mandate of this institution is more relevant than ever in a world where the values that it has embodied since it was established are being called into question. I also want to pay tribute to the work of the UNODC and Interpol which play a key role in preventing the trafficking of cultural goods, through judicial cooperation as well as by raising states’ awareness of these problems that are often still overlooked. I also want to pay tribute to the commitment, reflected by their presence this morning at the Security Council, of the under-secretary-general and the director-general of UNESCO, and to thank the UNODC executive director for his speech. I would of course like to thank the British presidency, without whom France and Italy would not have been able to issue this invitation. And I would of course like to express France’s wholehearted solidarity with the United Kingdom following the attack against its Parliament, the very cradle of democracy. The protection of heritage is a challenge for civilization, an ethical challenge that binds us together in all of our diversity. But it also poses a security challenge, because during conflicts, the illicit trafficking in looted cultural property finances terrorist networks and contributes to the development of armed conflict. The armed groups and in particular the terrorist organizations are bolstered by revenue earned from the trafficking of cultural heritage. Cultural property stolen in countries at war is in turn used to perpetuate and intensify conflicts. Even after the conflict, when peace has been restored, heritage continues to play a key role in peacebuilding since it helps promote resilience and unity among the affected populations. For all these reasons, the international community must mobilize its efforts; it’s a human requirement, a just cause and a key instrument in promoting lasting peace.